Lot # 99: 1961 Topps #577 Hank Aaron All-Star (PSA Gem Mint 10) - “1 of 4” PSA Gem Mint 10 Examples! 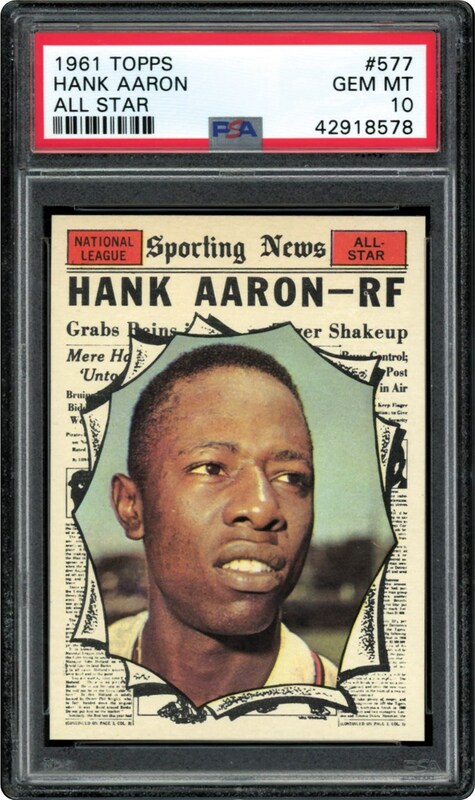 1961 Topps #577 Hank Aaron All-Star (PSA Gem Mint 10) - "1 of 4" PSA Gem Mint 10 Examples! Many historians stand by the notion that Hank Aaron's 755-lifetime homers still reigns supreme, disregarding Barry Bonds 762 mark due to Bonds' alleged use of performance enhancing substances. 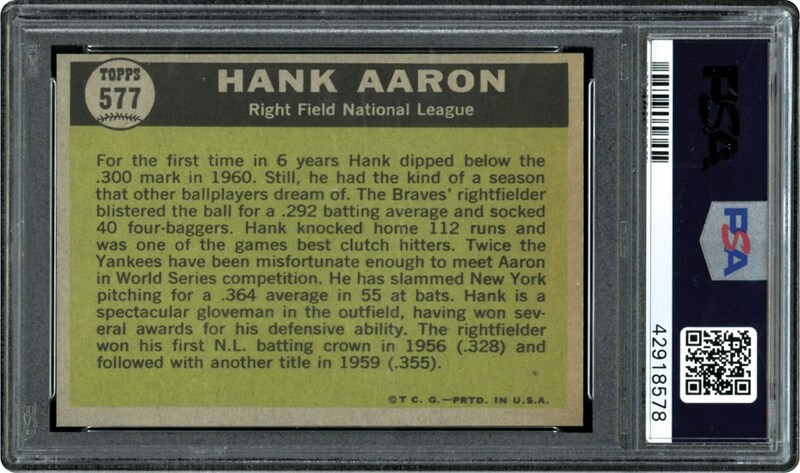 Synonymous with that perception is this unfathomable PSA "Gem Mint 10" 1961 Topps Hank Aaron All-Star offering that joins a meager 3 other examples as the finest of its kind! Indeed, this 58-year-old masterpiece has defied time to retain its original factory issued qualities that more than justify its elite assessment. The 1961 season would see the great Henry Aaron swat 34 round-trippers, bat a robust .327 and knock in 120 runs. Just another "year at the office" for the immortal slugger who was now compiling superstar seasons at a very consistent rate. That same year, Topps would choose an imposing "Hammerin Hank" cap-less portrait image for his prestigious Sporting News All-Star subject that portrays magnificent clarity, contrast and vibrant facial hues. Nearly "dead-on" 50/50 centering, blazing corner tips, immaculate surfaces, and vivid print registration all combine to elevate this 1961 "high-number" marvel to its current pinnacle standing!